DreamWorks Animation’s Turbo is another little guy makes big story. 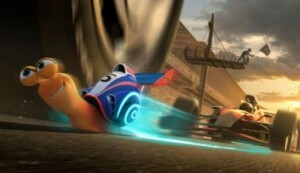 The movie tells the story of a common garden snail called Turbo (voiced by Ryan Reynolds, Green Lantern) who dreams of winning the Indy 500. When a freak accident gives him super sonic speed, he just might get his wish. The PG film also features the voices of Paul Giamatti (Win Win), Michael Pena (End of Watch), Samuel L. Jackson (Marvel’s The Avengers), Luis Guzman (The Count of Monte Cristo), Bill Hader (Men in Black 3), Maya Rudolph (The Way, Way Back), Richard Jenkins (Eat Pray Love), Michelle Rodriguez (Avatar), Ken Jeong (Pain & Gain), Snoop Dog and even real-life racer Mario Andretti. The film grossed $81 million at the box office. and a downloadable digital copy of the film. For a limited time, the DVD and Blu-ray/DVD Combo also carry a Turbo pullback toy.